Aguirre was born in San Sebastian, Jalisco on December 23. He attended primary school in Guadalajara, capital of the state of Jalisco, but his studies were interrupted by the Mexican Revolution. He joined Carranza's forces against Pancho Villa during this time but in 1917 he left to work in the state owned mine offices just like his father. In 1920 he became entangled in the revolution again when he joined the forces of Alvaro Obregon. After this he worked for the federal government and got so far as to work as a personal secretary for the President. By this time he had developed a passion and ability for art. In 1928, when he started working for a theater company building the set of Ulisses he began to gain attention as a professional artist. The positive critiques that he was subjected to about his work became an important factor for him to decide to start a career in art. Ignacio Aguirre was a founding member of such influential institutions as the Liga de Escritores y Artistas Revolucionarios (L.E.A.R. ), the Taller de Grafica Popular and the Salon de la Plastica Mexicana. From 1931 to 1965 he was also a teacher of Painting and Drawing at two of Mexico City’s most influential schools of art, Escuela Nacional de Artes Plasticas and La Esmeralda. 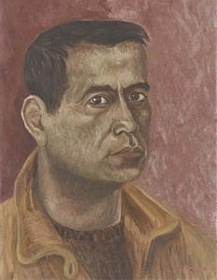 Aguirre held numerous solo exhibits in Mexico and abroad before he died in Mexico City in 1990.